1(a). The Company shall consist of a Master, Wardens, Assistants, Liverymen and Freemen. 1 (b). The first Freemen of the Company shall be the Members of the existing Company of Builders Merchants at the date on which these constitutions and ordinances come into force. 1 (c). The Master, Wardens, Assistants, Trustees and Officers of the Company of Builders Merchants at the date on which these constitutions and ordinances come into force shall continue in their respective offices until another Master and other Wardens, Assistants, Trustees and Officers have been elected and admitted in accordance with the provisions of the ordinances unless they or any of them sooner die, resign or are removed. 2. Every Member of the Court of Assistants of the Company at the date on which these constitutions and ordinances come into force shall, upon being admitted to the Freedom of the City of London and paying the prescribed livery fine, be deemed to have been duly admitted into the Livery of the Company, but any Member of the Court of Assistants of the Company who at the expiration of three months from the date on which these constitutions and ordinances comes into force is not a Liveryman of the Company shall be disqualified from executing the duties of his office until such time as he is a Liveryman of the Company. 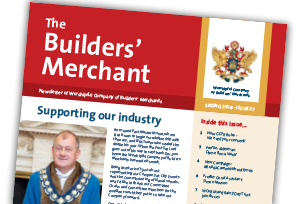 The latest issue of the Builders' Merchant newsletter is packed with the latest news on the Master’s year, member news and interviews.